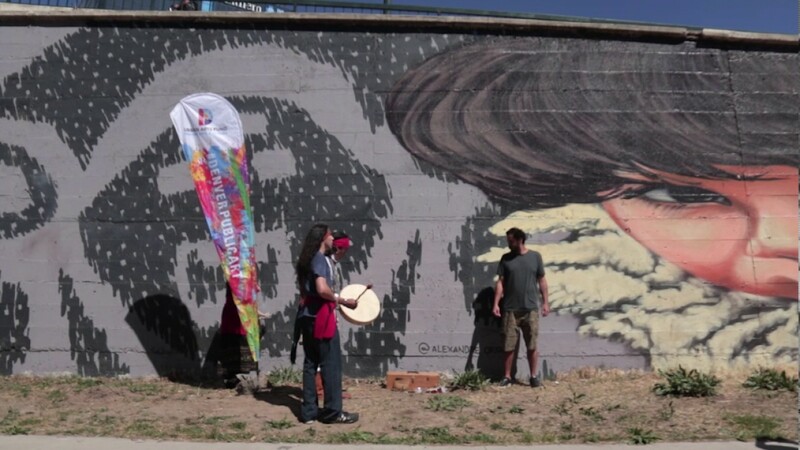 LOOK: Alexandre Orion's Cherry Creek Trail mural smiles again after vandalism - Denverite, the Denver site! Mar. 23, 2017, 3:00 p.m.
We first caught up with Brazilian artist Alexandre Orion in September when he was just beginning work on his experiments in forced perspective. Forced, that is, because one must stand down the path at an angle to best see the work. But last month trailgoers were forced to see something else: large black tags across Orion’s faces. Michael Chavez, public art manager for Denver Arts and Venues, said this kind of thing never happens. Even so, the mural program exists in the first place to deter rogue graffiti, “taking away that available space,” he said. Getting Orion to rectify the situation required a bit of effort, Chavez said. He is from Brazil, after all, so plane tickets were required in addition to more paint. Orion said it took four days to fix. He has trained a local artist to work on the mural if anything else happens in the future. The rededication ceremony also included a spiritual cleansing with a Native American drum song and smoke purification. But Orion, for one, is not miffed at the ordeal. He said he loves Denver, and any reason to come back is a good one.